Aloof and self sufficient, independent dogs can still make great family pets. Especially with families who have an active lifestyle. Not needing as much attention as the other personality types. They can be left home alone with little chance of destructive behavior. Although, they do tend to wander off more if left unsupervised outside. Dogs with independent personality types are generally pretty self-sufficient. Not needing much attention from humans, or socialization with other dogs. They may bond closely with one person, but may not form close bonds with the rest of the human family members, or with other animals in the house. Independent dogs are happy alone. The least likely of any personality type to resort to violence, independent dogs are more likely to remain neutral, or run from the situation. When forced into unknown situations, they are more apt to freeze up, or get anxious. Independent dogs can be easily intimidated. Attempting to dominate these dogs usually results in strengthening their independent natures. 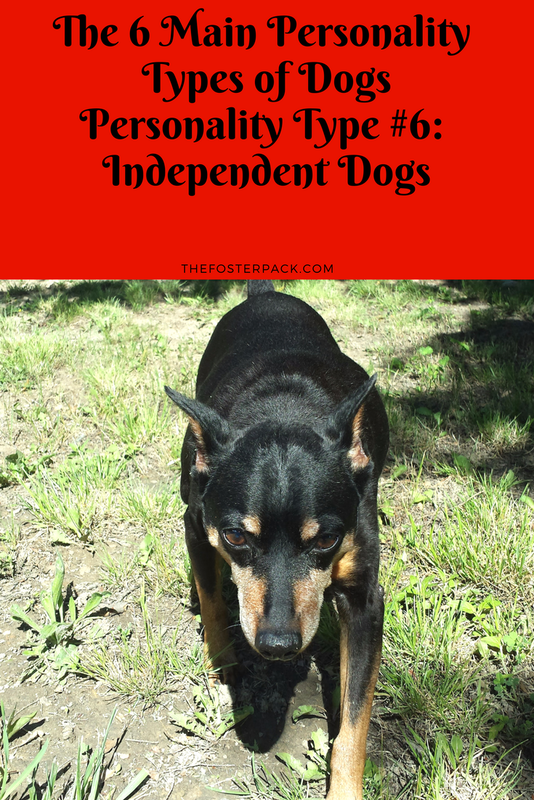 Independent personality type dogs rarely tend to be super loving, or attention seeking. There is nothing wrong with this, nothing with their personalities to “fix”. They don’t often have separation anxiety, or destructive behavior when left alone. Mostly finding a comfy place to sleep. Independent dogs are more likely to wander off, or escape, as they don’t have the strong family bonds. They can also be a bit harder to train in recall. Independent dogs are highly compatible with confident and outgoing dogs. Occasionally, playing with the other dogs. But mostly keeping to themselves. Adaptable and insecure dogs work well with the independent too. They may be compatible with aggressive personality type dogs, under close supervision. The independent dog will most likely ignore the other, after their initial greetings. Most of our Old Kids are of the independent personality type. They’ve formed a close bond with one person, mostly myself or our daughter. They are content to do their own things, and only spend time with the pack during supervised play time. They don’t need crates, even when we’re going to be gone for a long time. We just have to keep an eye on them outside during potty breaks, so that they don’t wander off.